Maui Greetings to each of of you! E ola mau e nā kūpuna o Kahalawai — life to the ancestors of Kahalawai, are words in a song I wrote honoring the ancestors many years ago in sacred ʻĪao Valley. It was a time when the voices on the wind punctured my walls of self doubt and fear, ushering in waves of healing from the doorway to the light. Crisscrossing sojourns across island terrains and human relationships, I found myself propelled by the force of what could not be seen with the naked eye. Only what was stripping away at intervals between the ticks & tocks of all I thought I was organized in surrendering to. In the stream of unconsciousness, my chambers of self inflicted ways of how I was suppose to live & behave, cracked open, spewing magma out from old wounds long disguised under superficial edifices of appropriate social acceptance. As it spilled, leaked and lay bare the empty something of nothing, I tried desperately to return to my place of illusionary safety, where the thick walls of behaving, doing, seeking, separating, pleasing and pretending could not keep me hidden from me. Pele burned and burned. From the ashes, sweet nectar flowing fierceness of grace in the womb of all I am, anointed my resurrection. Grace danced, laughed and rejoiced saying ‘aloha, welcome home!’ I split, fractured, spiraled up & down facing home without a place to stay. Who am I? What am I? Where am I? Why am I? Is this real? In January 2017, we will be gathering in the ancient land of Keʻanae, Maui to share the breath of spirit in the living waters of aloha. To be in communion with the ancient voices on the wind. Sacred land embracing life with its eternal wellspring of wisdom. Are we listening with all of our being? In this moment of tremendous change, every movement reveals the truth of our collective greatness, in service to all life. The pathway leads us in many directions of hoʻolōkahi i ka puʻuwai, unity in the heart. 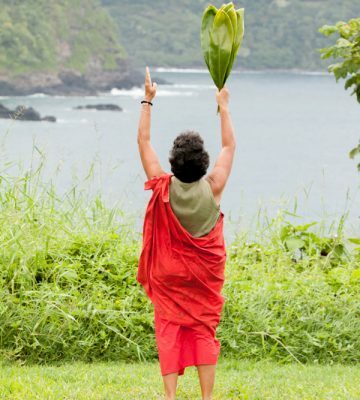 As one of many invited to the Tribe, offering prayer, blessings, ceremony, sessions and other surprises, the intention is simply to kōkua/help each one desiring to take their next aloha step in the dance of life. E ola mau e nā kūpuna O Keʻanae! Life to the ancestors of Keʻanae! Lei’ohu Ryder is a spiritual leader, visionary, healer, singer/songwriter and educator. She is an emissary of “aloha” and advocate for the indigenous soul in all people, blind to the labels (race, creed, nationality, ideology, etc.) that separate us from experiencing the true nature of our selves and others. Her love and knowledge of Na Mea Hawaii help us to connect with ourselves, with spirit, and to bepono (balanced in right alignment). Lei’ohu offers her gifts throughout the world with Aloha. Her talents and knowledge are honored and loved in her community and the world. Her work has been recognized by the Office of Hawaiian Affairs, Peace Corps, Sierra Club and the United Nations. Lei’ohu was awarded the Gandhi-King Peace Hero Award in 2002. Lei’Ohu will be on faculty and will offer private healing sessions at the HAWAII 2017 event.